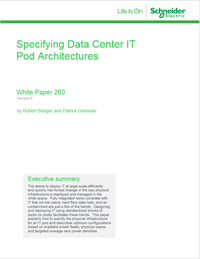 This Schneider Electric paper explains how to specify the physical infrastructure for an IT pod and describes optimum configurations based on available power feeds, physical space, and targeted average rack power densities. The desire to deploy IT at large scale efficiently and quickly has forced change in the way physical infrastructure is deployed and managed in the white space. Fully integrated racks complete with IT that roll into place, hard floor data halls, and air containment are just a few of the trends. Designing and deploying IT using standardized blocks of racks (or pods) facilitates these trends. 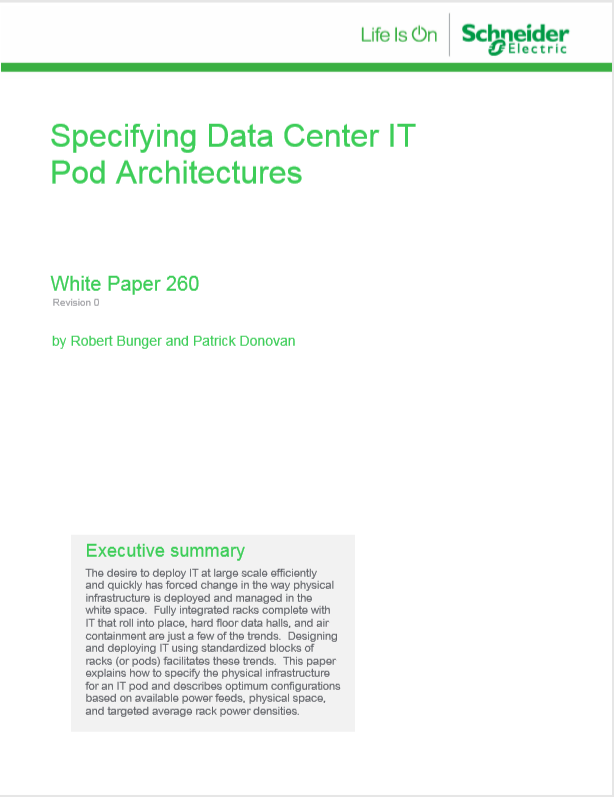 This paper explains how to specify the physical infrastructure for an IT pod and describes optimum configurations based on available power feeds, physical space, and targeted average rack power densities.